With the Holiday spirit surrounding us, I wanted to use this time to focus on a situation many of you have already faced or will encounter in the near future, the Holiday Party scene! The arrival of Fall marks the beginning of the Holiday season. This joyous time can also be a detriment to our diets. According to the National Institutes of Health, Americans will put on one to two pounds between November and January. This small gain will not immediately impact your health, but year after year of overindulging can lead to extra inches. Luckily, weight gain is not inevitable. Following a few simple guidelines can help prevent a waistline extension without forgoing the Holiday cheer. 1. Begin your day with a balanced meal. This should include whole grains, fruit, vegetables, and protein. Just before the party, eat a high protein small meal or snack so you aren't tempted to overeat. 2. Upon arrival, don't rush to eat. Socialize and settle into the festivities before you dig in. 3. Savor foods you truly enjoy and pass up on those that don't really interest you. 4. Move your socializing away from the buffet or appetizer trays. This will minimize the unconscious nibbling. 5. Bring your own dish. This will guarantee you have something healthy to eat, and the hosts will appreciate the gesture. Simple hummus or avocado dips with vegetables are a simple and tasty go to. 6. No matter what, place everything you eat on a plate. This will help you keep track of what you consume and prevent food amnesia. On the same note, opt for a small plate. Your plate may be full, but the portion will be less. 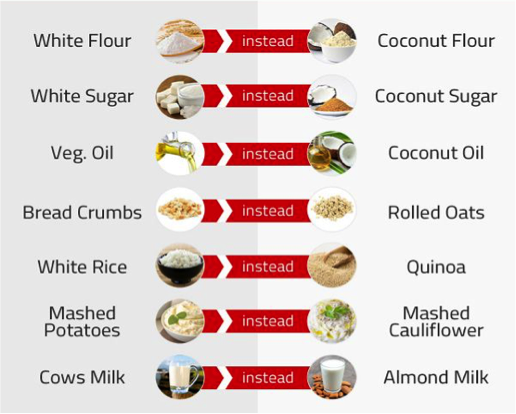 If you are hosting the Holiday bash, try these simple recipe swaps to boost nutrition without losing flavor. The Holidays are a wonderful opportunity to gather with loved ones over tasty foods we often only see once per year. With a little preparation and intentional thought, you can enjoy your favorite celebratory foods without extending your waistline.